Will computers ever truly understand what we're saying? From Apple's Siri to Honda's robot Asimo, machines seem to be getting better and better at communicating with humans. But some neuroscientists caution that today's computers will never truly understand what we're saying because they do not take into account the context of a conversation the way people do. Specifically, say University of California, Berkeley, postdoctoral fellow Arjen Stolk and his Dutch colleagues, machines don't develop a shared understanding of the people, place and situation – often including a long social history – that is key to human communication. Without such common ground, a computer cannot help but be confused. "People tend to think of communication as an exchange of linguistic signs or gestures, forgetting that much of communication is about the social context, about who you are communicating with," Stolk said. The word "bank," for example, would be interpreted one way if you're holding a credit card but a different way if you're holding a fishing pole. Without context, making a "V" with two fingers could mean victory, the number two, or "these are the two fingers I broke." "All these subtleties are quite crucial to understanding one another," Stolk said, perhaps more so than the words and signals that computers and many neuroscientists focus on as the key to communication. "In fact, we can understand one another without language, without words and signs that already have a shared meaning." "This shift in understanding how people communicate without any need for language provides a new theoretical and empirical foundation for understanding normal social communication, and provides a new window into understanding and treating disorders of social communication in neurological and neurodevelopmental disorders," said Dr. Robert Knight, a UC Berkeley professor of psychology in the campus's Helen Wills Neuroscience Institute and a professor of neurology and neurosurgery at UCSF. He found that the same regions of the brain – located in the poorly understood right temporal lobe, just above the ear – became active in both players during attempts to communicate the rules of the game. 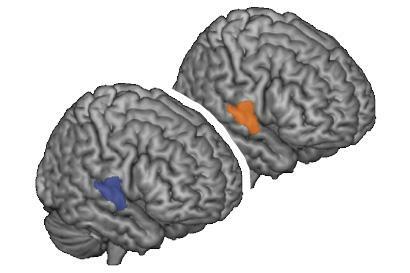 Critically, the superior temporal gyrus of the right temporal lobe maintained a steady, baseline activity throughout the game but became more active when one player suddenly understood what the other player was trying to communicate. The brain's right hemisphere is more involved in abstract thought and social interactions than the left hemisphere. "These regions in the right temporal lobe increase in activity the moment you establish a shared meaning for something, but not when you communicate a signal," Stolk said. "The better the players got at understanding each other, the more active this region became." "It is surprising," said Stolk, "that for both the communicator, who has static input while she is planning her move, and the addressee, who is observing dynamic visual input during the game, the same region of the brain becomes more active over the course of the experiment as they improve their mutual understanding." Robots and computers, on the other hand, converse based on a statistical analysis of a word's meaning, Stolk said. If you usually use the word "bank" to mean a place to cash a check, then that will be the assumed meaning in a conversation, even when the conversation is about fishing. "Apple's Siri focuses on statistical regularities, but communication is not about statistical regularities," he said. "Statistical regularities may get you far, but it is not how the brain does it. In order for computers to communicate with us, they would need a cognitive architecture that continuously captures and updates the conceptual space shared with their communication partner during a conversation." Stolk's studies have pinpointed other brain areas critical to mutual understanding. In a 2014 study, he used brain stimulation to disrupt a rear portion of the temporal lobe and found that it is important for integrating incoming signals with knowledge from previous interactions. A later study found that in patients with damage to the frontal lobe (the ventromedial prefrontal cortex), decisions to communicate are no longer fine-tuned to stored knowledge about an addressee. Both studies could explain why such patients appear socially awkward in everyday social interactions. "Most cognitive neuroscientists focus on the signals themselves, on the words, gestures and their statistical relationships, ignoring the underlying conceptual ability that we use during communication and the flexibility of everyday life," he said. "Language is very helpful, but it is a tool for communication, it is not communication per se. By focusing on language, you may be focusing on the tool, not on the underlying mechanism, the cognitive architecture we have in our brain that helps us to communicate." Stolk's co-authors are Ivan Toni of the Donders Institute for Brain, Cognition and Behavior at Radboud University in the Netherlands, where the studies were conducted, and Lennart Verhagen of the University of Oxford.